Alex Berrio Matamoros is an educational technology consultant and principal at AXBM EdTech. Berrio Matamoros, Alex. 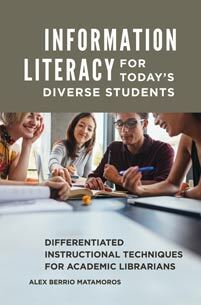 Information Literacy for Today's Diverse Students: Differentiated Instructional Techniques for Academic Librarians. Libraries Unlimited, 2018. ABC-CLIO, publisher.abc-clio.com/9781440862083. This book helps students from diverse backgrounds and with various learning styles to master the material they learn with these practical examples for librarians teaching higher education information literacy.